In the following questions two/three/four statements are given, followed by some conclusions. You have to consider the statements to be true even if they seem to be at variance from commonly known facts. You have to decide which of the given conclusions, if any, follow from the given statements? Statement I : All teachers are aged. Statement II : Some women are teachers. Conclusion I : All aged are women. Conclusion II : Some women are aged. Answer (c). 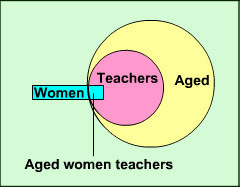 Since some women are teachers and all teachers are aged, some women (those who are teachers) are aged. 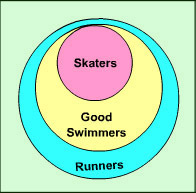 Statement I : All skaters are good swimmers. Statement II : All good swimmers are runners. Conclusion I : Some runners are skaters. Conclusion II : All runners are good swimmers. Statement I: Latha is a beautiful and intelligent girl. Statement II: She is very good. Conclusion I. All beautiful girls are intelligent. Conclusion II. Beauty and intelligence are the essential factors of goodness. 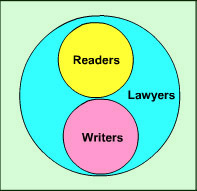 Statement I: All writers are lawyers. Statement II: All readers are lawyers. Conclusion I. Some lawyers are readers. Conclusion II. Some readers are writers. Answer (a). "Some readers are writers" may be a possibility but cannot be concluded from the given statements. Statement I: Due to contamination of water, large number of people were admitted to hospital. Statement II: The symptoms were of Typhoid. Conclusion I : Contamination of water may lead to Typhoid. Conclusion II : Typhoid is a contagious disease. Answer (a). Contagious disease is spread from one person to another by direct contact. That typhoid is a contagious disease is not deductible from the given statements. Statements I: 60% of the government employees went on strike. Statement II: Mr. Gopal is a government employee. Conclusions I: Mr. Gopal went on strike. Conclusion II: Mr. Gopal did not participate in the strike. Answer (d). Since Mr. Gopal is a government employee, he either participated or did not participate in the strike. Statement I: Temple is a place of worship. Statement II: Church is also a place of worship. Conclusion I: Temple is a place of worship for Hindus. Conclusion II: All churches are temples. Answer (a). Neither of the two conclusions can be derived from the statements. Statement :The human organism grows and develops through stimulation and action. Conclusion I: Inert human organism cannot grow and develop. Conclusion II: Human organisms do not react to stimulation and action. Statement I : Some towers are windows. Statement II : All windows are houses. Statement III : Some houses are temples. Conclusion I : Some towers are temples. 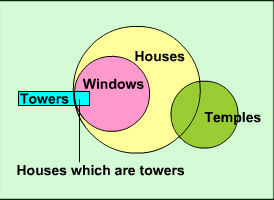 Conclusion II : Some houses are towers. Both conclusions I & II follow. Answer (b). The first conclusion of towers being temples is only a possibility but cannot be concluded from the given statements. Statement I: Man can find ultimate reality by dedication to God through meditation. Statement II: Meditation is the process to enrich the peace of mind. Conclusion I: Meditation is the process to realize the God. Conclusion II: Meditation does not help to find out the Mukti of Soul. Conclusion III: Perfect dedication to God is essential to realize the existence of ultimate reality. Only conclusions I and III follow. Statement I: All apples are bananas. Statement II: All bananas are sweet. Conclusion I: All apples are sweet. 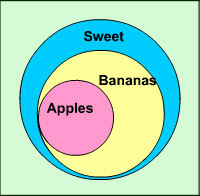 Conclusion II: Some bananas are apples. Statement I: All metals are silver. Statement II: All silver are diamond. Statement III: Some diamonds are gold. Statement IV: Some gold are marbles. Conclusion I: Some gold are metals. 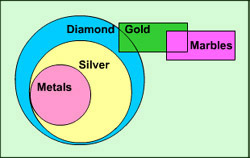 Conclusion II: All metals are diamond. Conclusion III: Some silver are marble. Conclusion IV: Some gold are silver. Statement I: All carrots are vegetables. Statement II: All tomatoes are fruits. Statement III: Some carrots are tomotoes. Conclusion I: Some vegetables are carrots. Conclusion II: Some tomatoes are vegetables. Conclusion III: Some carrots are fruits. Conclusion II: Some fruits are vegetables. Statement I: Some years are decades. Statement II: All centuries are decades. Conclusion I: Some centuries are years. Conclusion II: Some decades are years. Conclusion III: No century is a year. Answer (c). Some centuries are years cannot be concluded as indicated by probable diagram I and no century is a year cannot be concluded as seen in probable diagram II. Statement I: All bald men are rich. Statement II: All bearded men are saints. Statement III: Some saints are rich. Conclusion I: No bald man is a saint. Conclusion II: No bearded man is rich. Conclusion III: Some bald men are saints. Answer (c). As can be seen from the two probable diagrams, either no bald man is a saint or some bald men are saints.